Brooksby Hall offers a choice of four rooms which are licensed for marriage ceremonies, or alternatively Brooksby Church. Our beautiful period Hall dates back to the 16th century and can accommodate up to 100 guests for a civil ceremony. 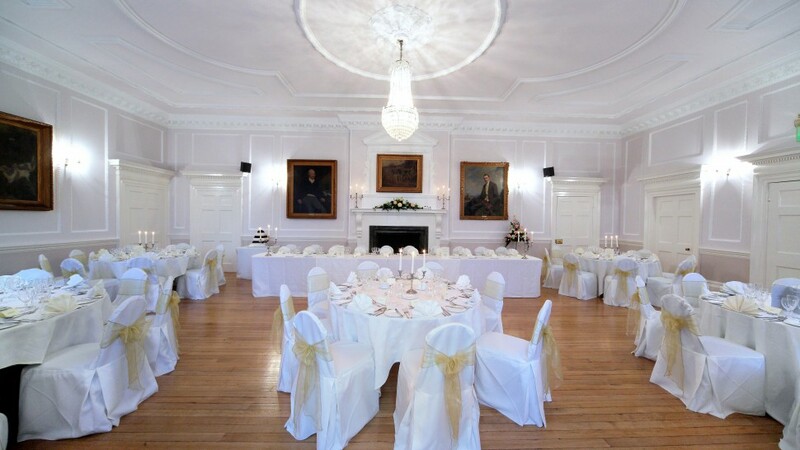 An elegant and tranquil oak panelled room that is capable of seating up to 50 guests for a civil ceremony. A beautiful oak panelled room that can seat up to 50 guests for a civil ceremony. A modern extension to the period hall which can seat up to 170 guests for a civil ceremony. A striking 13th century church set in the stunning grounds of Brooksby Hall. St Michael and All Saints Church is available for wedding ceremonies and blessings and can seat up to 100 guests. To make your wedding extra special and unique, we can organise specialist décor including drapes, prop hire, furniture hire, stage sets and other venue décor. We can transform any of our rooms into magical settings using stunning fabric drapery and exciting props. Whatever theme you choose, we can supply the props for the occasion, whether the wedding is Moroccan or American, Hollywood or Bollywood we can match the mood. We can take the theme for your wedding even further with bespoke photo-quality backdrops, party furniture to match any theme, inflatables, ceiling décor and even furnish with rugs, carpet or cushions. Then top off the whole wedding décor with superior quality drapes for a complete and total venue transformation.